Sierra de Cádiz, Cádiz's mountain range, is a "Comarca" (small county within the province with no administrative role) that has been declared a Biosphere Reserve by UNESCO. It's made up by a total of 17 villages, heritage of the old Al-Andalus and famous for its produce and gastronomy, its castles and tales of bandits. The Sierra de Grazalema Natural Park is the rainiest place in Spain, It also hosts a great diversity of flora and fauna. This area, known for its local crafts, leather goods, olive oil production and the famous Andalusí sweets, is next to the Alcornocales Natural Park, one of Europe's wonders. Our vehicle will pick you up at the Plaza de Sevilla, from where we will depart to explore the Sierra de Cádiz and enjoy its landscapes. 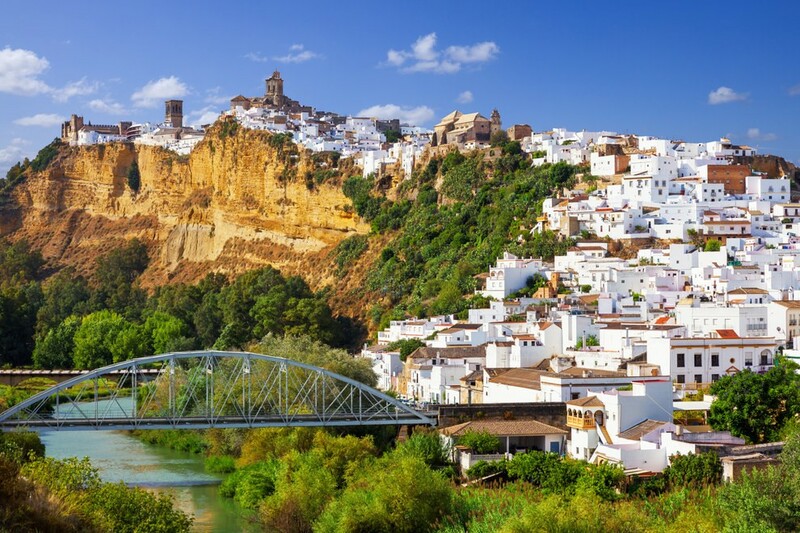 We will start the day in Arcos de la frontera to enjoy a guided tour through the municipality and connect its slopes to reach one of the most impressive viewpoints of the region, where we can hopefully admire the raptors wander around the area. We will continue our journey enjoying unbeatable panoramic views of the Sierra del Endrinal from the Puerto del Boyar towards Grazalema , a picturesque village at the top of the mountain, where we will take a pleasant walk enjoying the leisurely and slow pace of its streets. There you will have the opportunity to buy sausages and local cheeses, among the best in the region. The next stop will be in Ubrique , a town famous for its craft stalls. In this charming town we will take advantage to recover strength and taste the local gastronomy with a real rural lunch. On the way back we will pass by the bridge of La Pepa to enjoy one of the most impressive views of the bay, we will conclude our visit in the Plaza de Sevilla after a splendid day full of stories to tell.